Description: Empty BNSF coal train passing through the yard. Description: UPRR Muskogee, OK to Fort Worth, TX manifest train MMUFW-05 departs Roanoke on the UPRR Choctaw Subdivision - UP 4587, BNSF 6130, UP 5144, UP 7042, UP 4173, UP 1424, LLPX 2233, UP 9400, UP 4474, 105 cars, and ETD UPRQ 61014. Description: My first attempt at a night pan shot. It came out ok, but next time I need to use a tripod. 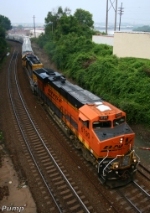 Title: BNSF 6130, BNSF's Aurora Sub. Description: BNSF 6130 ends hopper car train.